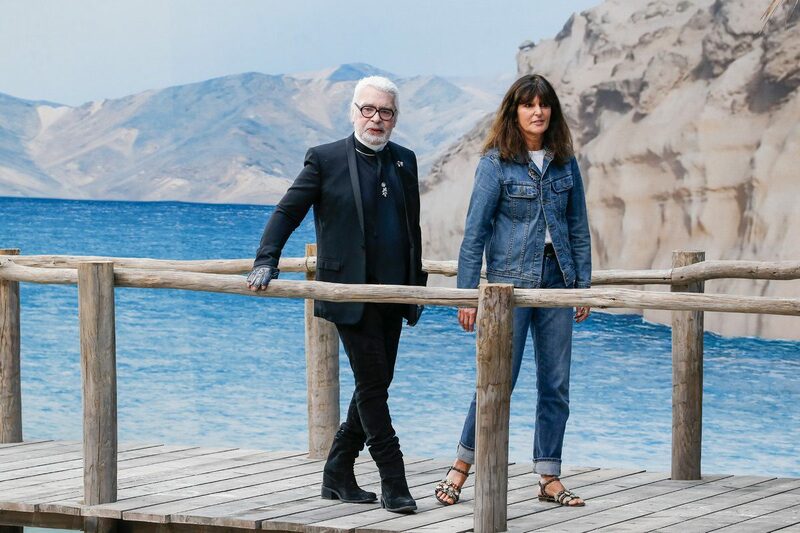 And so we wrap up a fashion filled month with a short holiday as we took our seats in the sand at Chanel. 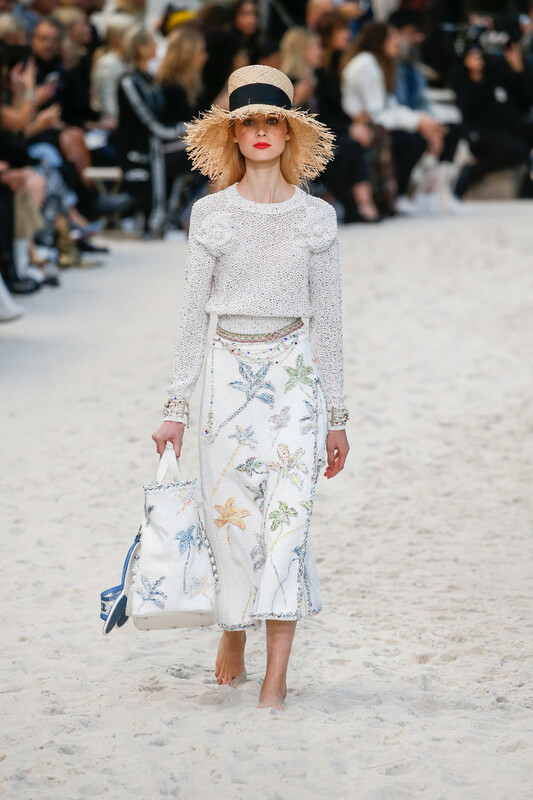 No models strutting the runway but a casual stroll on the Chanel beach complete with fake waves and a lifeguard. A fresh C breeze. They walked on their bare feet, but made sure they carried some new Chanel footwear in their hand, one or two handbags in the other hand. Although a few of the models carried the new handbags around their necks. Some even wore two shoulder bags attached to each other in the middle. They sported tweed suits in the loveliest palette of summer pastels. Sleeves tweed jackets were slightly oversized, but the short skirts made up for it. Real beach items too, like a bathing suit, a kaftan inspired dress and some spaghetti strap printed dresses. Followed up by a series of heavy leather classic jackets (as seen on Ola Rudnicka). Lots of lace, a few fringes, some ruffles and a selection of light knits in the mix. Black cycling pants during the day, black sequined looks at night. 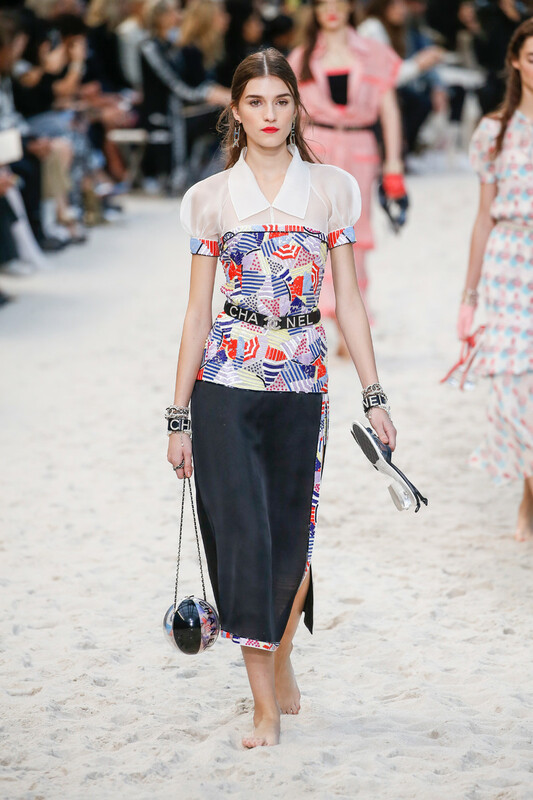 Leather gloves (the ones Karl Lagerfeld wears himself) and straw hats accessorized the looks. As “Chanel” earpieces, bracelets and an overdose of pearl necklaces added to the fashion house’s signature look. Every look was spot on Chanel, wave after wave. With the right dose of contemporary highs (the logo’s, the cycling pants) to keep Chanel relevant and young. Fully charged and inspired we left the perfect little Parisian beach behind us. Wish it could stay there as a perfect little escape from the city. Wish we’d already own of those sets of earrings.